The rational and impetus for using technology in the classroom must be rooted in good pedagogy. I recently had the pleasure of seeing Michael Fullan at COSL Manitoba who said, “A tool is only as good as the mindset using it, A fool with a tool is still a fool, a fool with a dangerous tool is only a dangerous fool.” This quote helps me orient my thoughts about technology and good teaching. All too often the toys and tools are chosen without a clear idea of what they will be used for. All of my posts will highlight firstly what educational need exists and then offer a technological tool that can satisfy that need. Often the solutions found or offers to teachers are simply substitutive in nature ie. digital textbooks, interactive websites ect. With the advent of Web 2.0 we can now offer a space where students can create, share, remix, and explore ideas and learn collaboratively. Ruban R. Puantedura offers a graphic illustrating the varying levels of infusion of technology in educati on. To find a meaningful use of technology in education requires that educators move beyond enhancement and towards the transformative. The Manitoba Government LICT (has published a document that supports the infusion of technology in education which also deserves recognition. Their focus was on moving technology from its supplementary position to an infused one. 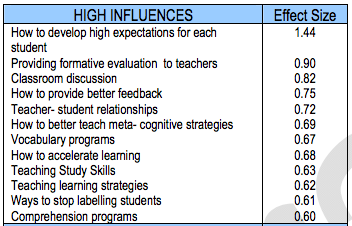 John Hatties extensive research in the area of student learning highlights the importance of feedback to drive deeper understanding for learners. I highly recommend his presentation Visible learning as well as his book with the same title which I will be reading shortly. Educators need to treat their profession as one that develops over time and we need to adopt techniques that enhance learning and abandon those that do not.